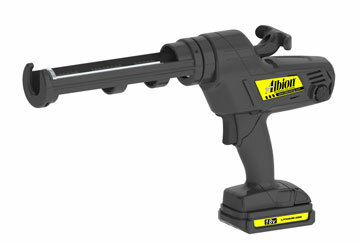 PRODUCT: Albion model 846-1E 1/10 Gallon (10oz) Cartridge 18V Lithium-Ion Battery Powered Caulk Gun Kit, with Battery and Quick-Charger. Price/Kit. DL-45-T14E, Sausage Pack, 10 and 20 oz.